Free Practice 1 + 2: In the first free practice sesion both Kaufmann Drivers were out on long runs to find the right car setting for the races. Jörg therefore only P 19 and Delétraz on P 26. In the second free practice the Kaufmann Drivers safed their new tyres for later in the weekend. 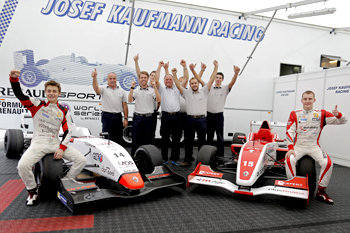 Again only on used tyres both were able to improve a lot and finished on P 8 Kevin Jörg and P 14 Louis Delétraz. Qualifying 1: In the first qualifying Delétraz was in Group A. In the short and all deciding Qualifying the Kaufmann Team opted for both sets of slick tyres. Louis Delétraz drove a strong Qualifying but still came only P 3 in the group. Kevin Jörg in Group B was dominating his session. Already on his first set of tyres he was close to match Group A. During the pit stop it started to rain and it wasn´t possible to improve times anymore. Jörg fastest in Group B. Starting Grid for Race 1: Jörg on P 2 - Delétraz on P 5. Starting Grid for Race 2: Jörg on P 4 - Delétraz on P 5. Race 1: In the first race it was raining that much, that the race was red flagged and most of the time run behind the Safety Car. With only a few race laps in the end Jörg finished on P 2 and Delétraz on P 4. Race 2: In the second race on Saturday afternoon, it was raining even more and the whole race was postponed. Similar to race 1, Safety Car and red flags didn´t allow any proper racing. In the end Jörg on P 4 and Delétraz on P 5. Qualifying 2: The second qualifying on Sunday morning the weather was still very bad. Massive rain and wind caused many red flags and delays. Jörg came on P 6 in Group B and Delétraz after a 2 hours long Qualifying session was P 2 in his group. Starting Grid for Race 3: Delétraz on P 3 - Jörg on P 12. Race 3: The track was still a bit damp for race 3 and the sky looked very cloudy. Kevin Jörg, whose only chances to claim the Championship title was to finish on the podium, took a risky decision and started the race on wet tyres. In the end this proved to be the wrong decision as it didn´t rain anymore during the race. Jörg finished on P 24. Louis Delétraz who was able to win the Championship in case he also wins the final race. After a good start he was very fast and put the leading driver under massive pressure. An overtaking move didn´t work out proper and Delétraz dropped back to P 4. In another attempt to gain back his position he went slightly of the track loosing further positions. In the end he finished the race on P 6. 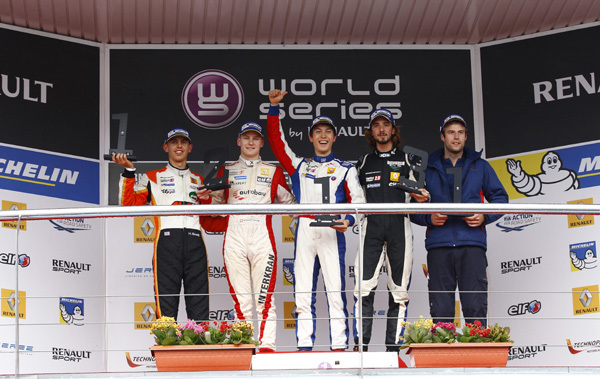 In the end Louis Delétraz became Vice-Champion of the Formula Renault 2.0 Eurocup 2015. Points equal with his teammate Kevin Jörg who finished 3rd overall. 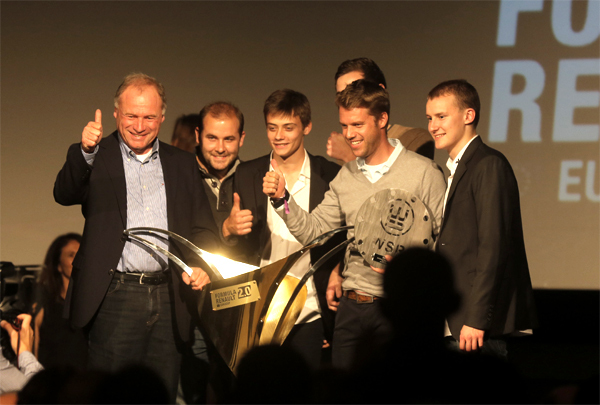 With a total of 4 victories and 11 podium finishs the Team of Josef Kaufmann Racing won the Formula Renault 2.0 Eurocup Team Trophy 2015. 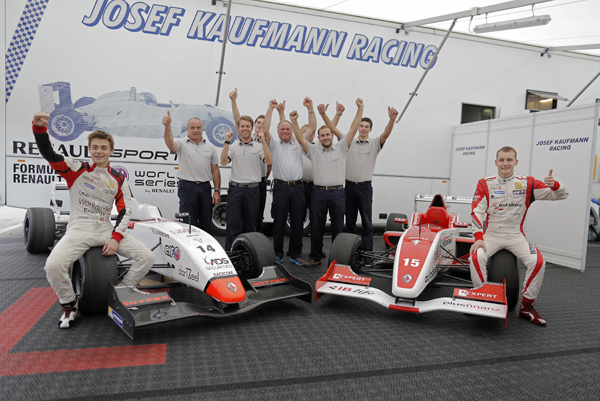 Overall once again a very successful season for the Josef Kaufmann Racing Team.